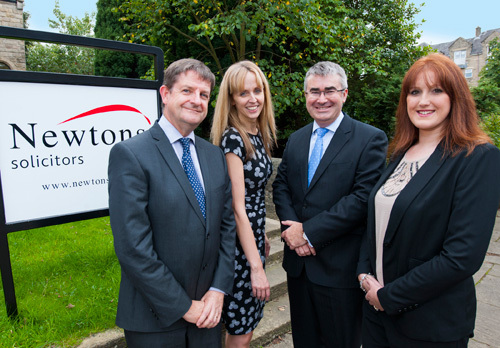 Law Society president, Andrew Caplen, who took office in July, visited Newtons Solicitors new office in Ilkley, which became the firm’s eighth base when it opened in July. A fast-growing Yorkshire firm of solicitors received a visit from the president of The Law Society last week (Sept 5) as part of his mission to meet northern practices and to prevent the professional body being seen as too London focused. Andrew Caplen, a Hampshire solicitor, who was accompanied by the Law Society’s regional manager for Yorkshire, Fiona Tatton, met Newtons Solicitors managing director, Chris Newton, who founded the firm in Knaresborough, North Yorks, in 2009 and Victoria Trelease, who leads the Ilkley office, to discuss the opportunities and challenges facing local law firms and the firms growth plans. Among other topics discussed were proposed changes to compulsory professional indemnity insurance for solicitors, maintaining quality standards, regulatory compliance issues and the challenges facing The Law Society in representing a growing range of legal practices around the country. Andrew Caplen became the 170th president of The Law Society in July. He was one of the co-authors of the Law Society´s Access to Justice Review and has written and spoken widely on access to justice and legal aid. Newtons Solicitors, which was founded by Chris Newton and his wife, Sarah, who is also a director, in 2009, has completed five years’ trading from a standing start and has seen turnover grow to £2.5M this year. The firm, which also has offices in Harrogate, Knaresborough, Ripon, York, Leyburn, Richmond and Darlington, has 13 directors and LLP partners and 38 lawyers. Issued for Newtons Solicitors by Mike Clarke Communications Ltd. Press contact: Mike Clarke, tel 07985-252251/01423-501663.